A team of researchers have developed a new treatment for stroke that reduces brain damage and accelerates the brain's natural healing tendencies in animal models. The findings are published in the journal Translational Stroke Research. 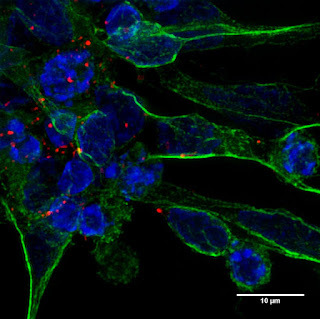 The research team led by UGA professor Steven Stice and Nasrul Hoda of Augusta University created a treatment called AB126 using extracellular vesicles (EV), fluid-filled structures known as exosomes, which are generated from human neural stem cells. Fully able to cloak itself within the bloodstream, this type of regenerative extracellular vesicles therapy appears to be the most promising in overcoming the limitations of many cell therapies-with the ability for exosomes to carry and deliver multiple doses-as well as the ability to store and administer treatment. Small in size, the tiny tubular shape of an exosome allows extracellular vesicles therapy to cross barriers that cells cannot. "This is truly exciting evidence, because exosomes provide a stealth-like characteristic, invisible even to the body's own defenses," said Stice, Georgia Research Alliance Eminent Scholar and D.W. Brooks Distinguished Professor in the College of Agricultural and Environmental Sciences. "When packaged with therapeutics, these treatments can actually change cell progression and improve functional recovery." Following the administration of AB126, the researchers used MRI scans to measure brain atrophy rates in preclinical, age-matched stroke models, which showed an approximately 35 percent decrease in the size of injury and 50 percent reduction in brain tissue loss - something not observed acutely in previous studies of exosome treatment for stroke. Outside of rodents, the results were replicated by Franklin West, associate professor of animal and dairy science, and fellow RBC members using a porcine model of stroke-the only one of its kind in the U.S.
Based on these pre-clinical results, ArunA Biomedical plans to begin human studies in 2019, said Stice, who is also chief scientific officer of ArunA Biomedical. "Until now, we had very little evidence specific to neural exosome treatment and the ability to improve motor function," said Stice. "Just days after stroke, we saw better mobility, improved balance and measurable behavioral benefits in treated animal models." Citation: Webb, Robin L., Erin E. Kaiser, Shelley L. Scoville, Tyler A. Thompson, Sumbul Fatima, Chirayukumar Pandya, Karishma Sriram, Raymond L. Swetenburg, Kumar Vaibhav, Ali S. Arbab, Babak Baban, Krishnan M. Dhandapani, David C. Hess, M. N. Hoda, and Steven L. Stice. "Human Neural Stem Cell Extracellular Vesicles Improve Tissue and Functional Recovery in the Murine Thromboembolic Stroke Model." Translational Stroke Research, 2017. Funding: ArunA Biomedical, Inc., Science and Technology Center Emergent Behaviors of Integrated Cellular Systems. Adapted from press release by University of Georgia.